Friday night is the night for choices in an otherwise mostly quiet week for arts. At Bophana Center on Friday 1 at 6 pm, choreographer Sophiline Cheam Shapiro will be presenting a film of her innovative dance Seasons of Migration, in which she guides her audience through the dance and discusses its themes of adjusting to a new culture and personal identity as a Cambodian in America, and the wider experience of the diaspora in Long Beach, California. The presentation is part of public programmes of SaSa Bassac’s Traversing Expanses exhibition. Also on Friday 1, at Chinese House from 7 pm, the opening of an exhibition by Thai artist Jitti Jumnianwai entitled Robots, featuring a range of his mixed technique paintings inspired by science fiction and children’s toys. And across town on Friday 1 at Showbox, one can head for the Unboxed Poetry Slam, where poets from Cambodia and across the globe are presented by host Kosal Khiev. 7 pm. On Sunday 3 it’s time for the fortnightly drink and draw session Soul TEA’se (#55, St 240). BYO materials, two hours worth of life model provided. $3 entry. 6.30 pm start. Looking a little further forward, a new informal creative community called Design Phnom Penh is holding a two-day event on August 9 and 10: the opening of the Arc Hub PNH 3D printing space, alongside what they call a design jam. They are keen to hear from designers, artists, engineers, innovators and creative of all kinds to present or display at the Sunday opening, and also would like to gather together some small groups of interested people (not necessarily with any skills or experience) to take part in the Saturday activities and workshops. Contact borismaguire ( at ) gmail.com or via these links pages. Friday 1 at 6 pm, Bophana Center and SaSa Bassac present choreographer Sophiline Cheam Shapiro’s film of her innovative dance Seasons of Migration, in which she guides her audience through the dance and discusses its themes of adjusting to a new culture and personal identity as a Cambodian in America, and the wider experience of the diaspora in Long Beach, California. Friday 1 from 7 pm at Chinese House, the opening of an exhibition by Thai artist Jitti Jumnianwai entitled Robots, featuring a range of his mixed technique paintings inspired by science fiction and children’s toys. Friday 1 from 7 pm at Showbox, the Unboxed Poetry Slam, where poets from Cambodia and across the globe are presented by host Kosal Khiev. Sunday 3 at 6.30 pm, the fortnightly drink and draw session Soul TEA’se (#55, St 240). BYO materials, two hours worth of life model provided. $3 entry. The week opens tonight, Tuesday 15, with Meta House presenting the Animals exhibition, featuring artists from five countries: Kosal Khiev (Cambodia), Matti Lankinen (Finland), Alma Mars Hyökkää Joutsenlahti (Finland), JP Page (NZ) and Myles Rattle (Australia). Animals explores different perspectives of the idea of the cartoon animal companion, with both collaborative and individual works. From 6 pm. Also tonight, Tuesday 15 at 6.30 pm, at Java Café, a farewell party for poet Alex Ratanapratum, Nou Hach Literary Association summer intern. The evening will feature open mic poetry and song. On Wednesday 16 a group of traditional musicians and dancers from Cambodian Living Arts return to Doors to play a blend of Chapei Dang Weng songs and Pin Peat and Mohaory music. From 8.30 pm. $5 entry fee includes one drink. On Friday 18 from 6 pm at SaSa Bassac, the opening of Traversing Expanses by Pete Pin, Amy Lee Sanford and Seoun Som, curated by Vuth Lyno. 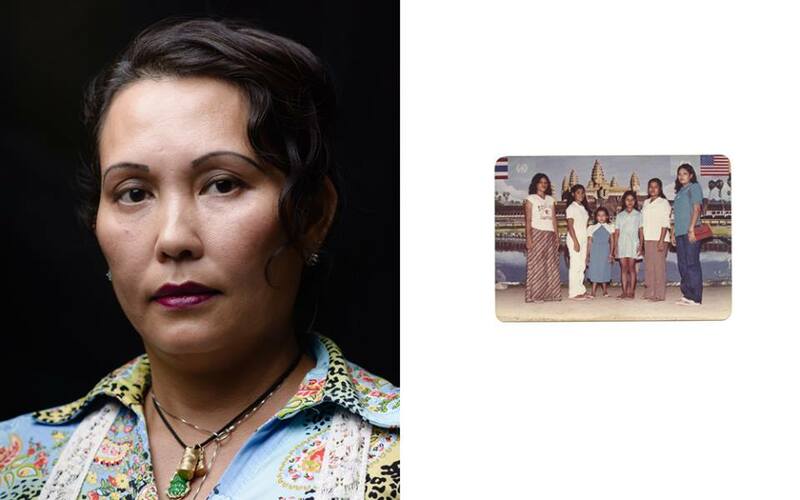 The exhibition explores and invites dialogue about Cambodian diaspora communities in the United States through photographic works by three Cambodian-American artists. On Saturday 19 from 6.30 pm at Le Saint Georges, tapas bar and restaurant (#111, St 136), the opening of Phnom Penh Streets by DownTown Collective, a photography exhibition featuring works by Jean-Francois Perigois and Jason Sacchettino. Also on Saturday 19, at 7 pm, Meta House hosts a screening of BBC Media Action’s Down this road (2014, 113 min), a musical road movie directed by Chey Sambath, produced by Chhin Sothea and written by Ines Sothea, Chap Somchanrith and Neang Sotheary. The filmmakers will hold a Q&A afterwards. On Sunday 20 at 7 pm, Cambodian film collective Kon Khmer Koun Khmer presents the six winners from this year’s Chaktomuk Short Film Festival, and show trailers from the new film project Pram Ang. A Q&A with organisers and filmmakers will follow. Bophana Centre reminds that applications for the Ian Masters-led ScriptLab 2014 close this Sunday. The details here. Tuesday 15, 6 pm at Meta House, opening of the Animals exhibition, featuring artists from five countries: Kosal Khiev (Cambodia), Matti Lankinen (Finland), Alma Mars Hyökkää Joutsenlahti (Finland), JP Page (NZ) and Myles Rattle (Australia). Tuesday 15 at 6.30 pm at Java Café, a farewell party for poet Alex Ratanapratum, Nou Hach Literary Association summer intern. The evening will feature open mic poetry and song. Wednesday 16 from 8.30 pm, traditional musicians and dancers from Cambodian Living Arts at Doors. Friday 18 from 6 pm at SaSa Bassac, the opening of photographic exhibition Traversing Expanses by Pete Pin, Amy Lee Sanford and Seoun Som, curated by Vuth Lyno. Saturday 19 from 6.30 pm at Le Saint Georges, tapas bar and restaurant (#111, St 136), the opening of Phnom Penh Streets by DownTown Collective, a photography exhibition featuring works by Jean-Francois Perigois and Jason Sacchettino. Saturday 19 at 7 pm, Meta House hosts a screening of BBC Media Action’s Down this road (2014, 113 min), a Cambodian musical road movie, with Q&A to follow. Sunday 20 at 7 pm, Cambodian film collective Kon Khmer Koun Khmer presents the six winners from this year’s Chaktomuk Short Film Festival, and show trailers from the new film project Pram Ang. A Q&A with organisers and filmmakers will follow. A quiet week, well timed to deal with the change in the weather. Something different at Bophana Center on Wednesday 9, a lecture by Dr Ang Chaulean: Various forms in the abstract representation of the divine in Cambodia. The lecture is co-presented by SaSa Bassac, as a part of the public programme for the exhibition Rubber Man by Khvay Samnang which runs until Saturday 12 (at SaSa Bassac). Starts at 6.30 pm. Also on Wednesday night, Phnom Penh Community College’s evening programme continues with the first of a two sessions on Cubist oil painting hosted by Chann Dina. Bookings essential. On Saturday 12 from 1 pm to 5 pm, Nou Hach Literary Association holds its annual Writers’ Seminar at the Cambodia-Japan Cooperation Center (CJCC) near RUPP in Phnom Penh. The broad programme features a panel discussion on the future of Khmer literature, a dance performance by Sophiline Arts Ensemble followed by a talk on the future of Khmer dance, and finally the presentation of awards for short fiction and poetry. The event is open to the public, all are welcome. Bophana’s Cineclub this Saturday 12 at 2 pm features the documentary Cameraman: The Life and Work of Jack Cardiff, one the career of a renowned cinematographer. Bophana Center is calling for applications for ScriptLab on August 2 with Ian Masters, seeking those keen to tell film stories or have projects looking for further development. Check it all out here. Priority to Cambodian candidates. Dipika Kohli, of Orangutan Swing, is trying something a little out of the ordinary. The plan is an open-format conversation about the concept of “fromness”. Origin: A Conversation will take place on the evening of Wednesday 23; RSVP to dipika [ at ] orangutanswing by Thursday 10 if you are interested. Venue TBC, dependent on numbers. Wednesday 9, 6.30 pm at Bophana Center, a lecture by Dr Ang Chaulean: Various forms in the abstract representation of the divine in Cambodia. Co-presented by SaSa Bassac, as a part of the public programme for the exhibition Rubber Man by Khvay Samnang which runs until Saturday 12 (at SaSa Bassac). Wednesday 9, 6.15 pm, Cubist oil painting workshop hosted by Chann Dina Phnom Penh Community College. Bookings essential. Saturday 12,1 pm to 5 pm, the annual Nou Hach Literary Association Writers’ Seminar at the Cambodia-Japan Cooperation Center (CJCC) near RUPP in Phnom Penh. A panel discussion on the future of Khmer literature, a dance performance followed by a talk on the future of Khmer dance, and the presentation of awards. All are welcome. Saturday 12 at 2 pm, Bophana’s Cineclub features the documentary Cameraman: The Life and Work of Jack Cardiff, one the career of a renowned cinematographer. The Classical Concert Series continues at Meta House this Wednesday 2 at 8 pm, featuring fourhanded piano with Giovanni De Cecco and Alberto Firrincieli, who will be performing works by Brahms, Schumann and Rubinstein. On Thursday 3 from 6.30 pm Java Café is hosting The Meeting of The Contemporary and The Classical: Between Two Cultures: a conversation with Malaysian dramaturge Lim How Ngean, Malaysian choreographer Naim Syahrazad, and Cambodian choreographer Phon Sopheap to discuss “the meeting of differences and similarities that lead to productive artistic energies.” In English with Khmer translation. Free entrance. A second chance for a bite of classical music this week on Saturday 5 from 7.30 pm with a recital at K West restaurant (#1 Street 154, corner of Sisowath Quay, next to Wat Ounalom), Giovanni De Cecco (piano) and Anton Isselhardt (flute) present Baroque Sonatas. Free Entrance. Recently established in Phnom Penh is a fortnightly drink and draw session every second Sunday from 6.30 pm at Soul TEA’se (#55, St 240). BYO materials, two hours worth of life model provided. $3 entry. And the next one is this Sunday 6. Coming up at Phnom Penh Community College, a series of Tuesday evening photography workshops focusing on twilight and night Photography. Commences July 22. Check out below for details. Wednesday 2 at 8 pm, the Classical Concert Series continues at Meta House featuring fourhanded piano with Giovanni De Cecco and Alberto Firrincieli, performing works by Brahms, Schumann and Rubinstein. Thursday 3 from 6.30 pm Java Café hosts The Meeting of The Contemporary and The Classical: Between Two Cultures: a conversation with Malaysian dramaturge Lim How Ngean, Malaysian choreographer Naim Syahrazad, and Cambodian choreographer Phon Sopheap to discuss “the meeting of differences and similarities that lead to productive artistic energies.” In English with Khmer translation. Free entrance. Saturday 5 from 7.30 pm, a classical recital at K West restaurant (#1 Street 154, corner of Sisowath Quay, next to Wat Ounalom), Giovanni De Cecco (piano) and Anton Isselhardt (flute) present Baroque Sonatas. Free Entrance. Sunday 6 at 6.30 pm, drink and draw session at Soul TEA’se (#55, St 240). BYO materials, two hours worth of life model provided. $3 entry.